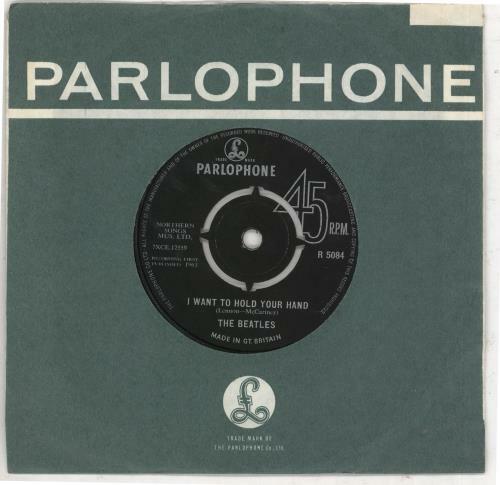 THE BEATLES I Want To Hold Your Hand (1963 UK Decca pressed 7" vinyl single, also including This Boy, with intact original four prong centre, Parlophone company die cut paper sleeve. With advance orders of some 1.75 MILLION copies, EMIwere forced to outsource pressing of some singles & LPs, just to meet demand. These were mainly to Oriole, CBS, Decca & Pye, sometimes Philips. This is a Decca sub-contracted press without stamper letter at three o'clock in the run out area &aridge 3mm from the perimeter of the push out centre. The vinyl on this copy remains in VG-/VG condition, with just light surface scuffs to show for over fifty five years R5084).